Auckland Zoo is a really good way to spend half-a-day if you are visiting Auckland. It is fairly easy to get to - being situated close to the central city at Western Springs Reserve and is connected to the Museum of Transport and Technology by a historic Melbourne W-Class tram. Auckland Zoo has been around for a long time, but has undergone modernisation changing old cages into more open, animal-friendly areas. It has more than 1000 birds and animals within its beautifully kept grounds, which are filled with lush plants and trees. The creatures include kiwis, tuataras (lizards), tigers, elephants, masses of monkeys, giraffes, hippos and a pride of lions that you can get within inches of (thank goodness for strengthened glass). The Auckland Zoo has a number of themed areas where many of the animals get to live in space and comfort. They are the Pridelands, Hippo River, Rainforest, Asian Elephants, NZ Aviary, Kiwi and Tuatara House, Primate Trail and Penguin Shores. For any ex-patriot Australians there is a wonderful little section featuring lots of Aussie wildlife including wallabies, emus and parrots. It isn't a huge zoo and is easy to walk around. 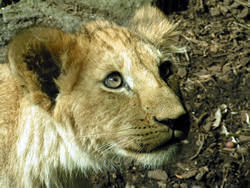 When we went we were rather captivated by the Pridelands and spent at least 45 minutes in a small shelter watching through glass as 10 lions - including six gorgeous cubs - mucked about and fed. It was a great experience for both adults and children. Auckland Zoo is open every day (excluding Christmas Day) between 9.30am and 5.30pm, although you can't get in after 4.15pm. In winter, 1st June - 31st August, the Zoo closes at 5:00pm. For information and timetables call Rideline on 64 9 366 6400.